The 1.5x Rectangular Reading Magnifier U1-4D from Nikon features a handle that rotates 360° and has a freely adjustable angle. The handle can be held in either the left or right hand, and can also be used as a support stand to minimize the burden on the hand and arm while holding for long periods of time. Additionally, folding the handle makes for a compact, storage-friendly form factor. 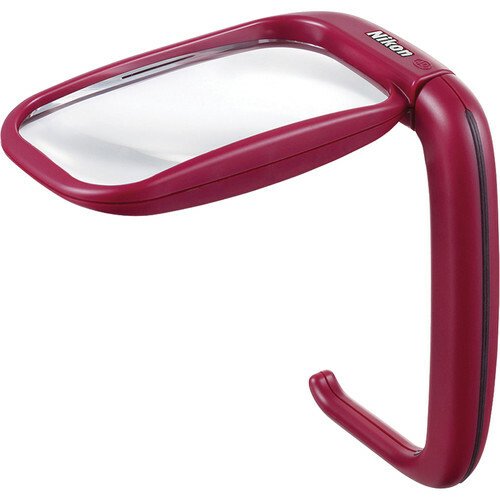 The magnifier's high-precision aspherical lens reduces image distortion all the way to the lens periphery. A hard coating on the acrylic lens surface prevents scratching. Box Dimensions (LxWxH) 10.1 x 4.5 x 0.9"
See any errors on this page? Let us know. Items marked "USA" are imported and/or distributed by the manufacturer or the manufacturers official licensed importer/distributor and are warranted by them. Items marked "Imported" are imported and/or distributed by other entities and are warranted by B&H Photo-Video. "Imported" products do not qualify for manufacturers rebate programs. There is no difference in the item itself. Click here for additional information.